In Pirates: Tides of Fortune players set sail across the high seas and lay claim to their own Pirates Haven, a place that promises glory and gain in the form of plundered treasure and resources to anyone brave enough to claim the title of Pirate Captain. As one such brave soul it is your responsibility to establish your own private hideaway Haven from which you can orchestrate all manner of trade, diplomacy and of course pirate raids on rivals strongholds and ships. Pirates: Tides of Fortune is browser-based and does not require a client download and is completely free to play with an optional premium currency to aid players in the game. To get ahead a Pirate Captain must be savvy when it comes to managing their resources, the three in particular that they will require to run their Haven are Gold, Timber and Rum. Each are used in various ways, with the various actions that players can take in the game from performing raids with their crew to constructing buildings, they will need a steady income of resources either through their own production buildings or as plunder from attacks on other ships and rival Havens. As a Captain progresses and advances their Haven they will need to unlock new Discoveries, technologies that will give them access to new units, upgrades, buildings and fundamental features that will benefit their organisation. Discoveries come in the form of a tech tree that players can advance down with an element of customisation of which path they take, there are also able to upgrade technologies that they have previously unlocked to further improve them. Players have their own Island Haven to build on, broken down into a gridded area each building that they wish to construct will take up a portion of that available land and so players must plan ahead on which buildings they require or face having to remove them in the future to make room for other buildings. As well as constructing buildings players will primarily be focusing on training up new crew and constructing ships for their fleet, each type of unit has different stats and vitals making them proficient in different ways, typically as defenders or attackers and so should be used by the player as such. A well-balanced crew is required to take down enemies to steal their resources but also defend themselves from rival players looking to do the same. Combat is completely automated and based off the choice of units, quantity available and their upgrades as to how a battle will play out and who will be victorious. 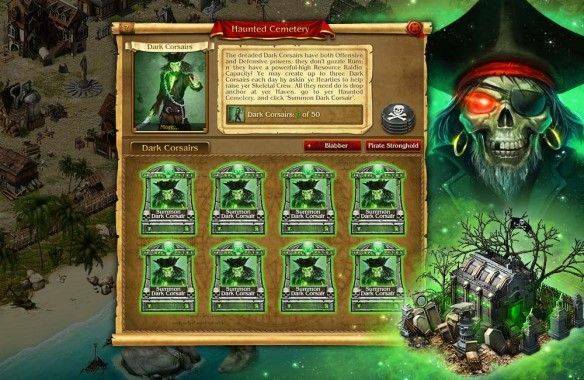 There are a variety of other features in the game that players can benefit from such as ongoing tasks, quests and daily missions that they can complete in order to gain valuable resources and rewards. Similarly with various actions that can be performed players are able to unlock achievements which as well as showing their accomplishments will also give them extra bonuses upon completion and give them a direct target to work towards.